T & J Waffles is a food truck specializing in homemade waffles serving a variety of sweets as well as savory items. Be aware, some addiction may occur! The Liege Waffle originates from a town in Belgium called Liege. The Liege Waffle is a richer, denser, sweeter, and thicker waffle. They are cooked from a dough, not a typical American style batter. 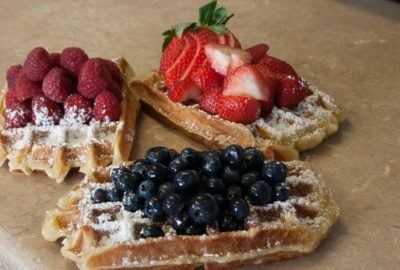 Unlike any other type of waffle, this dough has pearl sugar chunks which adds an unforgettable, addicting, sweet sensation as you take your first bite into the liege waffle. Born in Annonay France, Chef and owner Thierry Reboullet has fond memories of hot waffles dusted with powdered sugar enjoyed at the beach, vacation resorts, parades and county fairs. In France, waffles (Gauffres) are very popular snacks or desserts eaten anytime of the day. To share those memories, Chef Thierry with his son Thomas, have been perfecting a new style of dessert and snack – light and crispy homemade waffles (Fait Maison). At Tom & Julie Waffles, we put a smile on every waffle served and are taking pride in serving you a great waffle that’s fresh and absolutely delicious. As we’ve said, “Warning! Some addiction may occur! !